Early 20th century brass cased bulkhead barometer. Porcelain dial with red capital highlights to the scale. 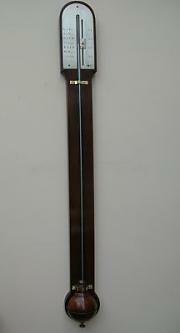 Porcelain dial protected by bevelled glass.Blued steel pointer with brass handset knob. 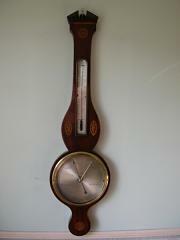 Early 20th century carved honey oak aneroid hall barometer and mercury thermometer. 34" high 8" diameter main scale. 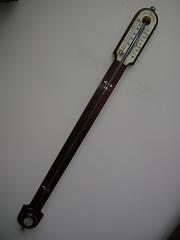 Stick barometer by Thomas Lorkin from London. 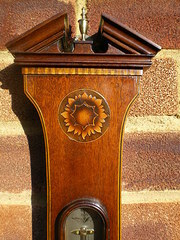 Figured mahogany case with broken pediment and urn finial. Case is edge chequer strung. Silvered brass register scale and mercury thermometer protected by glazed door. 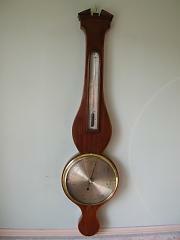 Mahogany cased stick barometer by Jacob Abraham from 7, Bartlett St., Bath. Abraham was instrument maker to the Duke of Gloucester and the Duke of Wellington. 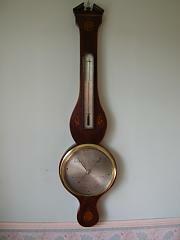 Mahogany, and mahogany crossbanded veneer cased stick barometer by Matthew Berge, London. Silvered brass scale engraved late Ramsden. Berge took over the business of Jesse Ramsden when he died in 1800. 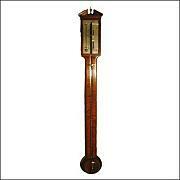 Mahogany cased stick barometer with scroll pediment by Gilbert and co. from London. Locking glazed door protecting silvered brass scales.